To many, the most exciting aspect of Team Penning or Ranch Sorting is the competition. 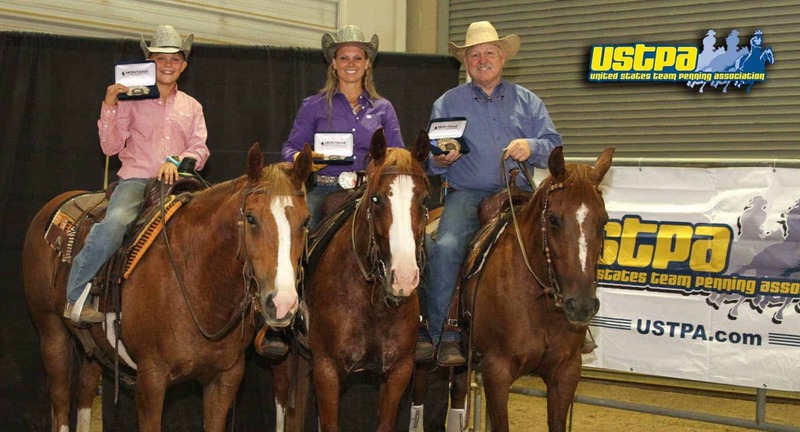 The prospect of being named the “Champion” of a class propels many United States Team Penning Association (“USTPA”) members to strive for improvement with every ride. The USTPA offers a variety of special awards and accolades for our top competitors. Every USTPA Nationally Produced Show offers classes appropriate for penning and sorting riders of any rating level (1-7). Each of the classes are placed with cash awards being distributed to the top teams based on fastest run and cash and prizes are awarded to the top teams in the average. See the USTPA Rule Book for more information on distribution levels of cash, prizes and awards. Every USTPA Regionally Produced Show offers classes appropriate for penning and sorting riders of any rating level (1-7). Each of the classes are placed with cash awards being distributed to the top teams based on fastest run and cash and prizes are awarded to the top teams in the average. See the USTPA Rule Book for more information on distribution levels of cash, prizes and awards. Most USTPA Regions produce an Annual Regional Championship Show offering classes appropriate for riders of any rating level (1-7). Qualifications are required to compete at Regional Championships and vary by Region. Each of the classes at the Regional Championships are placed with cash awards being distributed to the top teams based on fastest run and cash and prizes are awarded to the top teams in the average. See the USTPA Rule Book for more information on distribution levels of cash, prizes and awards and contact your Regional Director for information on qualifications for your Regional Finals. Each year, the USTPA produces a World Championship Show offering classes appropriate for penning and sorting riders of any rating level (1-7). Qualifications are required to compete at the World Championship. Each of the classes at the World Championships are placed with cash awards being distributed to the top teams based on fastest run and cash and prizes are awarded to the top teams in the average. The top ten teams in the average at the World Championship also receive prizes. See the USTPA Rule Book for more information on distribution levels of cash and refer to each year’s World Championship Show information for details on specific prizes for that year. © 2019 USTPA. The USTPA is the copyright owner of all information contained herein. Although the USTPA provides this information to anyone, with the exception of member only sections, the USTPA retains the copyright for all text and graphic images. This means that you CANNOT distribute the text or graphics to others without the express written permission of the USTPA; “mirror” or otherwise include the text or graphics on your own server or documents without our permission; or otherwise modify and/or re-use the text or graphics on this system. You MAY print copies of the information for your own personal use, store the files on your personal computer for your personal use only, and reference hypertext documents on this server in your own documents.